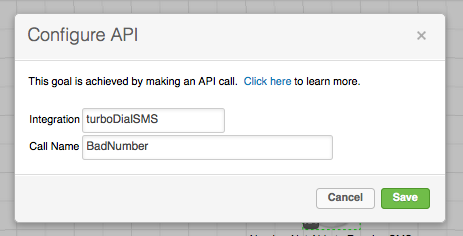 When turboDial sends or receives an SMS text message it will trigger corresponding API Goals in your Infusionsoft account if you have created them. The following sections explain the different API Goals you can use to trigger automation when an SMS message is sent or received. When an SMS message fails to send because the owner of the number has replied ‘STOP’ or similar, and as a result Twilio will not allow you to send an SMS from the current ‘from’ number to that phone number. You can likely succeed with an SMS by choosing a different ‘from’ number but that is not a good practice. When an SMS message fails to send because the service provider for the destination phone number has decided the message is ‘spam’ and blocked it. You can likely succeed with an SMS by choosing a different ‘from’ number. Where nnnnnnnnnn is the Inbound destination phone number the message was sent to. For example, if the message was sent to +19523142318 then the Call Name will be ‘Inbound19523142318’. Where yyyyyyyyyyyyyyyyy is a modified representation of the email address that turboDial forwarded the inbound message to. For example, if the message was forwarded to a turboDial user with the email address of MaryAnders@zmail.com then the Call Name will be ‘maryanderszmailcom’. Note that the email address is modified to be compliant with the Infusionsoft rules for a Call Name: only letters and digits are allowed. Also, the letters are all converted to lower-case. You may want to use this API Goal to trigger a sequence that notifies your user via Campaign SMS that they have received an inbound SMS and should check their email. This Goal will trigger only if an email address from the SMS was installed into the Contact Record ‘Email’ field. turboDial will install an email address when an inbound SMS containing an email address results in the creation of a Contact Record. It will also install an email address when an inbound SMS containing an email address is associated to a Contact Record that has an empty ‘Email’ field and the ‘FirstName’ field is ‘(auto-created)’. When an SMS Opt Out is received for identified Contact Records. These include “STOP”, “STOPALL”, “UNSUBSCRIBE”, “CANCEL”, “END”, “QUIT”. See this page at Twilio for more information. Note the turboDial recognizes that list of opt out words regardless of uppercase or lowercase. You should use this API Goal to trigger automation that will change the status of the contact such that your campaigns will no longer send them SMS text messages. When an SMS Opt Back In is received. These include “UNSTOP”, “START”, “YES”. The OptOut case above is useful for taking action in your Infusionsoft account to prevent further attempts to send SMS messages to the contact. Also see this Twilio page for important additional information.